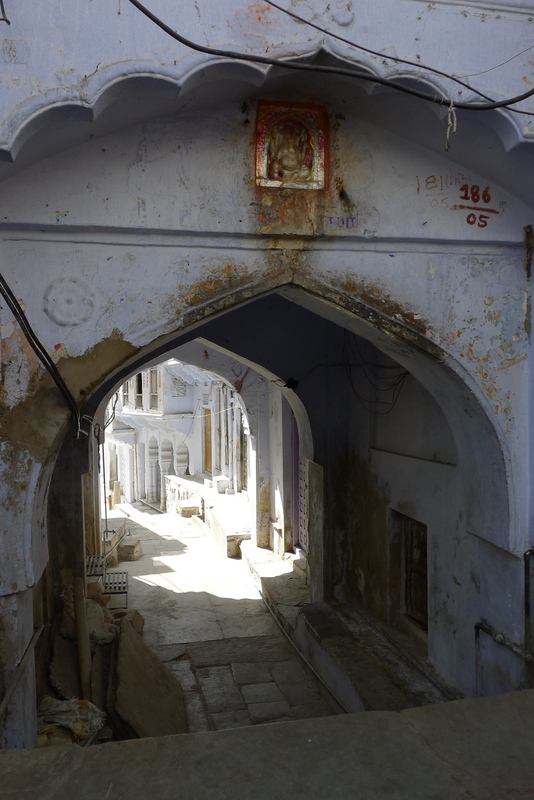 We had one full day in the holy city of Pushkar. How did it go? As any good day in India should go, full of the unexpected. This morning, the unexpected was salty coffee. (Those super fine granules at the bottom of the sugar bowl that we thought were just crushed sugar cubes – not sugar.) This afternoon, the unexpected was a Hindu prayer by one of the holiest bodies of water in India. I had a lovely encounter with an older Sadhu during my first visit to India, that time on the banks of the Ganges. Perhaps my memories of that experience made me a little softer with this white tank top clad Brahmin priest than I otherwise might have been. 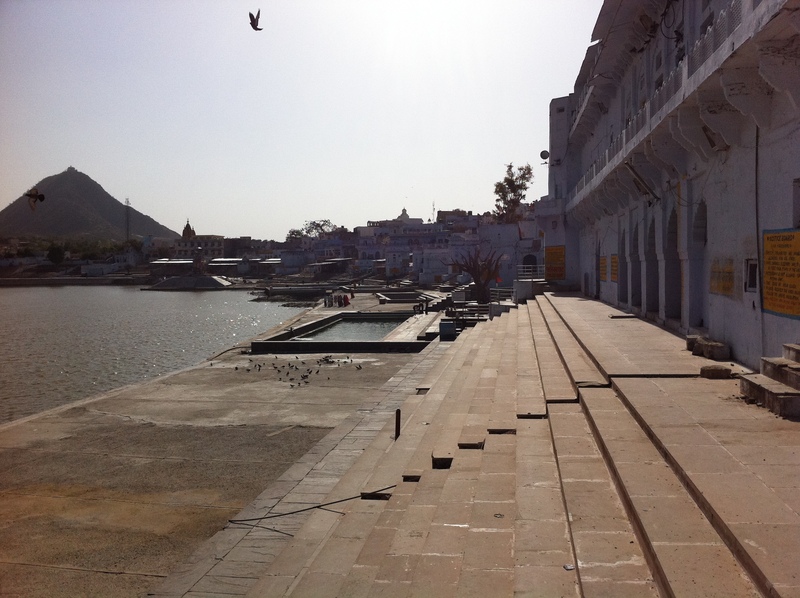 The Pushkar exchange started with a gentle suggestion from priest Carlo to walk down to the ghats along the water. I had already been and so was patiently waiting for the gentleman to leave before continuing my walk back to the hotel. This, apparently, was obvious, and soon I was, with little choice otherwise, following him down to the edge of the lake. Ignoring the stairs covered in pigeon poop, I removed my sandals and proceeded barefoot. Ignoring the trash and plastic bags floating in the green water, I took a seat on its edge. Watching and listening to Carlo chant was magical. He filled my cupped hands with water and with minimal resistance on my part I began tossing handfuls of the holy water into the lake, wishing for the long life of my family: husband, father, mother, sisters, brother, and grandparents. As I walked home later, vermillion on my forehead, a red string on my wrist, and 100 rupees lighter (a donation of course), I thought about my unexpected events for the day: 90 rupees for salty coffee. 100 rupees for a long life full of happiness and prosperity for those closest to me. Of the two, I knew which was the better bargain.